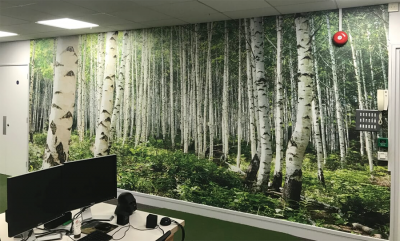 Vista Digital (Stand No 106) will be using the P&D Show to showcase and explain how digital wallcoverings can now be printed in one piece eliminating the need for joints. Over ten years the company has built a network of trained installers across the UK and also has a partnership with Dulux who facilitate training courses. Says a company spokesperson ‘’Multi length murals are still the norm in digital wallcoverings. Standard mural printing can come with its own problems due to colour shading issues between length, poor alignment and miss matching of the joints. Having experienced all this ourselves we were on the look out for a better option. When we came across a material, and more importantly the printing capacity, to print extra wide widths our Onepiece mural was born”. During the two days of the Show Vista Digital will be demonstrating its product with its live installation wall. Decorators will able to see first hand how the product feels and applies to the wall and able to get ‘hands on’. Any decorator wanting to promote Onepiece to their customers will be able to take away the Vista Digital promotional pack which includes brochures, leaflets, samples. Decorators can earn up to 20% commission on sales they generate. The company will also be will running a competition to win a Mural (subject to size), visit stand 106 for details.